This website may contain copyrighted material the use of which has not always been specifically authorized by the copyright owner. We are making such material available in our efforts to advance understanding of environmental, human rights, political, economic, democracy, scientific, and social justice issues, and so on. 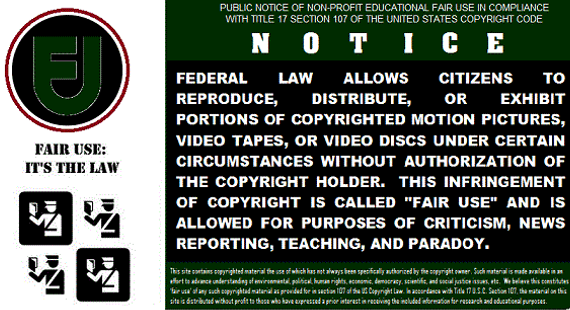 It is believed that this constitutes a 'fair use' of any such copyrighted material as provided for in section 107 of the US Copyright Law. In accordance with Title 17 U.S.C. Section 107, the material on this site is distributed without profit to those who visit this site. The material in this site is provided for educational and informational purposes only. The information on this site does not constitute legal or technical advice. If your copyrighted material appears on this web site and you disagree with our assessment that it constitutes “fair use”, contact us at carolecgood@aol.com.